The Chinese market for smartphones is not known for its particularly exciting local device offerings. It looks however, that Motorola is about to change this state of affairs with the release of its latest Android phone - the XT882. The Motorola XT882 is a truly unique device - it is powered by a Tegra 2 dual-core processor, it has dual mode GSM/CDMA network support and yes, the two network radios are operational simultaneously, so it's also dual standby. All in all, it is the king of dual in smartphones, if you ask Motorola. The rest of the device's specs resemble closely it's ATRIX 4G cousin. Along with the NVIDIA Tegra dual-core CPU, there is a 4" qHD display, an 8MP camera with 1080p recording capability, and 8GB of internal storage which is expandable through a microSD card slot. Unlike the Atrix 4G though, the XT882 runs with Android 2.3 Gingerbread, dressed in the latest version of MOTOBLUR. The dual-personality droid by Motorola will be available in China only for around $830. The price definitely appears steep until one gives it more thought. After all, having an XT882 saves you the trouble of carrying one more device with you - along with its dual-network and SIM support, the Motorola device offers dual-standby as well. 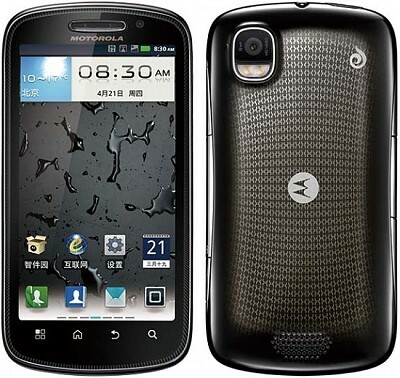 We say that such a level of comfort might actually make the Motorola XT882 a successful project for the company. We can also think of more countries where such functionality will be highly appreciated so, hopefully, a similar device will be released by Motorola for other markets as well. Hit the source link below for the full press and tell us what do you think in the comments section.